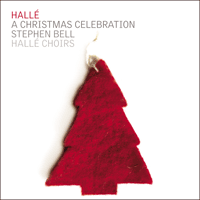 An album celebrating the Manchester festive tradition when the whole Hallé musical family, not just the Hallé and Hallé Choir, but the Hallé’s superb Youth Choir and Children’s Choir too, joins together for hugely popular annual Christmas concerts. Christmas is a time for the family, and one of the joys of the Hallé’s annual Christmas concerts is the way that it unites the whole Hallé musical family: not just the Hallé and Hallé Choir, but the Hallé’s superb Youth Choir and Children’s Choir too. That gives a special flavour to this annual Manchester tradition. Of course there are carols, some familiar, some rather less so—and this recording features music that might, or might not, date from the 14th century alongside some unmistakably 21st-century sounds. There’s time for wintry magic and quiet contemplation; but there are songs here too that sparkle as brilliantly as the lights on any tree. The Hallé carol concerts are a joyous celebration of seasonal tradition in the fullest sense: of Christmas past, present—and future. But you can’t start a concert without a stirring overture. If you’ve ever caught yourself humming the theme tunes to Ladies in Lavender or Hetty Wainthropp Investigates, you’ll already know the music of Nigel Hess. He wrote A Christmas Overture in 2007 at the request of John Rutter (we’ll be hearing from him later), and it’s a wonderfully bright and hearty procession of ancient carols of both the sacred kind (Il est né le divin enfant, Infant Holy Infant Lowly, Personent hodie, Angels From the Realms of Glory) and the slightly more tipsy variety (Ding Dong Merrily, Deck The Halls). That’s the thing about a classic: you can put it away in the loft for a whole year, but with a quick polish and a sprinkle of glitter it still comes out every December looking like magic. The Hebden Bridge-based conductor Darius Battiwalla directs the Sheffield Philharmonic Chorus: he adapted the French Christmas hymn (it dates from at least 1847) O holy night with a great Northern choir and orchestra very much in mind. John Gardner (1917-2011) was a Mancunian by birth, and his lively adaptation of the old English carol Tomorrow shall be my dancing day for St Paul’s School, London, is from 1965—but it’s hard today to imagine a Christmas without it. In dulci iubilo really has been around so long that we’ve lost track of its roots—the earliest known version dates from a German monastery somewhere around 1328 (the monk who first wrote it down, Henry Suso, said that it was originally sung to him by angels). Whether in Mike Oldfield’s 1970s synth version or this rather more elegant arrangement, it’s become one of the best loved of all carols. Noel! on the other hand is something completely new. Roderick Elms composed it to mark Stephen Bell’s appointment as the first Associate Conductor of the Hallé Pops, and it was premiered in December 2013 in The Bridgewater Hall. This ‘Festive Romp for Organ and Orchestra’ takes four familiar tunes—The Sussex Carol; I Saw Three Ships; Masters in this Hall; Of the Father’s Love Begotten—plus a few others and gives them a makeover guaranteed to raise the roof of any concert hall. Let’s be honest—these days, classic movies on the TV are every bit as much of a Christmas tradition as Midnight Mass and Nigella’s mince pies. You might recognise Somewhere in my memory as the theme from the 1990 movie Home Alone (remember Macaulay Culkin pulling that face? ): it shows just how composer John Williams can capture that seasonal ‘gingerbread feeling’ as magically as he can transport us to Hogwarts or Hoth. The music of Adam Saunders—a native of Derby—has appeared on the soundtracks of The Sopranos, Mad Men and Sabrina the Teenage Witch, and his brilliant Fairytale Sleighride sounds like the score to an imaginary Christmas movie (listen out for some scary moments from the brass—and some sitcom capers from the bassoon). John Rutter, meanwhile, has combined the bright tunefulness of British light music with the English cathedral tradition to create a brand of Christmas magic that’s entirely his own. He’s inspired legions of imitators (cathedral choristers describe them collectively as ‘I Can’t Believe it’s Not Rutter’). But there’s no mistaking the graceful freshness of the real thing. He describes his Angels’ Carol (1988) as ‘a joyful carol of celebration’. Three more British composers offer a vision of Christmas that’s as warming and as robustly English as mulled cider. The fact that Personent hodie originally came from medieval Bavaria (by way of a Finnish hymn-book) didn’t make it any less English to Gustav Holst—whose own ancestry was Scandinavian. The Holy Boy has reappeared in many different guises, with and without voices, since John Ireland’s poignant ‘carol’ for solo piano appeared during the wartime Christmas of 1915. During the Second World War, the composer made this version, played by the Hallé strings. In Jesus Christ the apple tree Elizabeth Poston (1905-1987) transfigured an 18th century Methodist hymn into something timelessly peaceful and affecting, particularly with the voices of the Hallé Youth Choir. It’s amazing how much difference a great arrangement can make to a familiar tune. As the principal horn of the Royal Opera, Richard Bissill knows exactly how to write music that orchestras love to play, and you can hear that flair in every bar of A Christmas Carnival. Less a medley of famous carols than a Richard Strauss-like festive tone-poem for full symphony orchestra, Bissill created it in 1986 for his then colleagues in the London Philharmonic—but it never sounds any less sumptuous. It’s one of those Christmas parcels where the wrapping is as fabulous as the gift. Some melodies, though, feel so natural that we simply assume that they’ve been around forever. The simplicity and quiet eloquence of In the bleak mid-winter make it feel more like a folk-song or hymn than the work of a single creative spirit. Yet it was composed in 1909 by the young English composer Harold Darke (1888-1976) while he was the organist at Emanuel Church, West Hampstead. Darke was a member of a generation of British composers steeped in the traditions of Anglican hymnody and the English folk-song revival. And in Russia, Nikolai Rimsky-Korsakov drenched his glittering fairytale operas in the melodies and stories of Slavic folklore. You just know that come spring, things aren’t going to end happily-ever-after for the enchanted heroine of his 1882 opera The Snow Maiden (the clue’s in the name): for now, though, the high-kicking Dance of the tumblers sets the scene for vodka-fuelled festivities deep in old Russia. The poor lovelorn Snow Maiden wouldn’t last very long in Hawaii—though who today, surrounded by sleet and last-minute shoppers, hasn’t dreamed of a Christmas in the tropics? Marta Lynn Keen’s Christmas on the beach at Waikiki is a huge favourite with young singers—you’ll hear why. But, tempting though it is, we can’t really end a Christmas album under the palms, so here’s a vision of Christmas that no-one with a sense of fun can resist: the fabulously swinging Sleigh ride dished up by the king of American light music Leroy Anderson at his home in rural Connecticut during the sweltering hot summer of 1946. It’s been covered by everyone from Ella Fitzgerald to Debbie Gibson—but there’s nothing to match the easy wit and post-war style of Anderson’s suave and sassy original. And with that it only remains for everyone at the Hallé to wish you a very Merry Christmas.